1. How did your family come to be in the Santa Maria Valley? My parents came from the Philippines to Hawaii. I was born in Honolulu. My parents arrived in the mainland around 1927 settling in the Sacramento area. My father was a migrant workers contractor. I went with him as he traveled from city to city for work. My parents divorced and my mother relocated to Santa Maria Valley where I attended elementary school, I believe I attended main street school. I met and married my husband Ben Sepe in 1941. He was much older than me. I was very young around 16 years old. We remain in this area and raised a family. 2. What challenges did they/you faced? I remember my husband Ben experiencing racial discrimination at that time. When you go to a theater, it was segregated, the whites at one side and the Orientals on the on the other side. People would just stare at us. We witness more discrimination towards the blacks. 3. What makes you proud of the Filipino Community? We, the Filipino pioneers are proud because we have paved the way for the new generation of Filipinos coming from the Philippines. We had the challenges of discrimination. In the 1920s and 1930s, we Filipinos provided cheap agricultural labor. The farmers courted us because of our good work ethics. 4. What contributions does the Filipino Community make to the larger community? I am the Vice-President of the Santa Maria Valley Filipino Seniors and our main goal is to provide scholarships for our young people as well as helping other people in the community who are in need. Many of the American-born Filipinos are not exposed to some of our traditional customs. We, seniors perform some of our cultural dances. In the Philippines, there are about 90 different dialects as well as different food. We share the making of our famous and popular dishes that are enjoyed by everyone. However, over the years our descendants arebecoming educated and are exposed to the large community as educators, doctors, nurses, engineers, business owners, office managers, government employees, etc. For example, around the early 1970s (1974) the mayor in Arroyo Grande was Filipino, Mr. De Leon. 5. What issues does the Filipino Community faces? Educating our young people about the Filipino pioneers. Paving the way for them. For these young people to understand the obstacles that the pioneers had to undertake in order for them to better appreciate the opportunities of today. Speaking English is no problem for the Filipinos since it is taught in the Philippine schools. Annie Sepe and Ben Mosqueda long time companions and both of their spouse passed away after over 50 years of marriage. Annie and Ben had been friends for decades and practically neighbors they just lived one block of each other. They have the same circle of friends as well as being good friends. So, they married on May 4, 2002 at St. Mary of the Assumption Church. They the oldest couple to get married she was 77 years old and he was 79 years old. They had 28 couples in their wedding party. The reception took place at the Santa Maria Elks Lodge with 480 guests present to celebrate their marriage. Since their marriage, they have been busy traveling to Hawaii, Las Vegas, and Los Angeles. Their pastime is going to the Chumash Casino and visiting families. 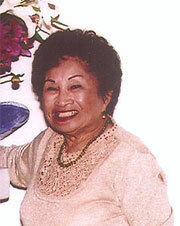 Annie is the President of the Filipino Seniors and will be celebrating the organization’s 20th anniversary on September 15, 2007. Annie said this is her last big bash she will be overseeing; the Philippine Vice Consul will be present along with the local dignitaries. We are proud of Annie’s accomplishments to the community of Santa Maria.